Any organization in the world has its own goal, unique or not. What’s important that some people want to create something new or improve an already existing thing and offer it to the public. All actions, resources and employees’ work are aimed at reaching this goal. If we talk about IT sphere, then we need to point out that all companies intend to develop a software for users which will satisfy all their expectations in the best way possible. At the same time the owner of the IT-product expects to enjoy not only ratings and positive feedback but the profit received as well. One of the factors to influence software quality is a well performed check by the QA department and its testing in particular. As the testing has to be done through all the software development stages, it is very important to perform it fast and timely. EasyQA test management tool can help you cope with this task as it allows to upload and share software builds for testing. How to upload a build or add a link? Where test objects are stored? How to share test object? To upload builds you need to have an added organization and a project. By opening a My Projects we can upload a test object. To do so, press Add Test Object button. If we need to add a test object to an already existing project, you just click on the project title. On Project Overview page you also will see the button for test object adding. The user can also add test object on Test Objects page. This page displays all the test objects uploaded so far. 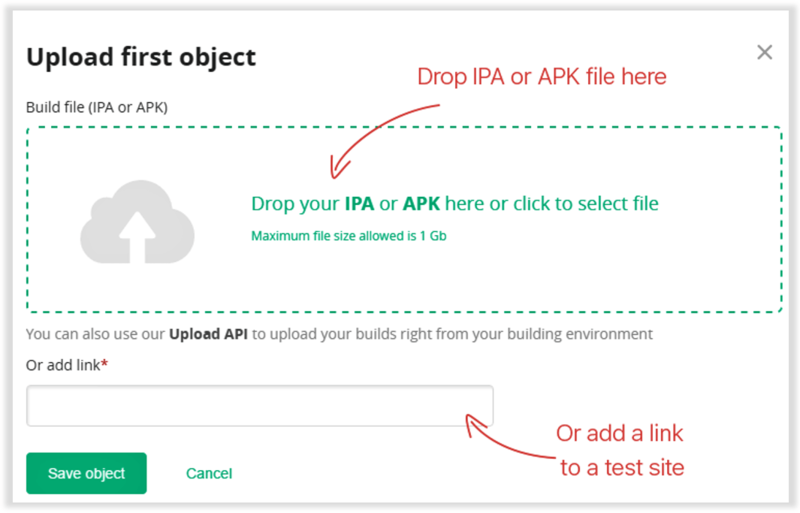 After pressing Add Test Object button you will see a page for uploading a build-file. You can also add the link of the tested website for testing. The data about all stages of development are saved along the time of project existence in EasyQA test management tool. You cannot delete the uploaded test object. After uploading the file or typing the link to the tested web site, you can click Save object button. When file uploaded successfully, the build will be displayed on the Test Object list of all uploaded project test objects which looks like a table with each build file’s short description. If you want to view a more detailed test object description, you should press the arrow button located next to the entry which will display more info about a particular build. The user have an opportunity to share a test object with team members immediately after uploading in EasyQA test management tool. Also, each team member can open Test Objects page and copy required link at any time. As the user might have a fully formed organization, a working project, so it is very convenient and fast to share the link to the build file installation by selecting the recipients from the team members list. You can do this by pressing Send by email button. The user selects recipients by clicking on a checkbox. The last step is to press Send link button. All test objects link recipients are able to open the link from the email and install the test object on a chosen device for its testing. If you open the test object link in the mobile phone browser, it will be downloaded and then installed. That’s it – you can start testing. EasyQA test management tool allows to get build directly from GitHub or GitLab. To start this process, you need to integrate EasyQA project with these systems first. The user can add plugin on Integrations page, Plugins tab. To generate a new token, you should access: GitHub->Settings->Personal Access Tokens, type required info and click "Generate new token" button. In the new window select scope "repo". 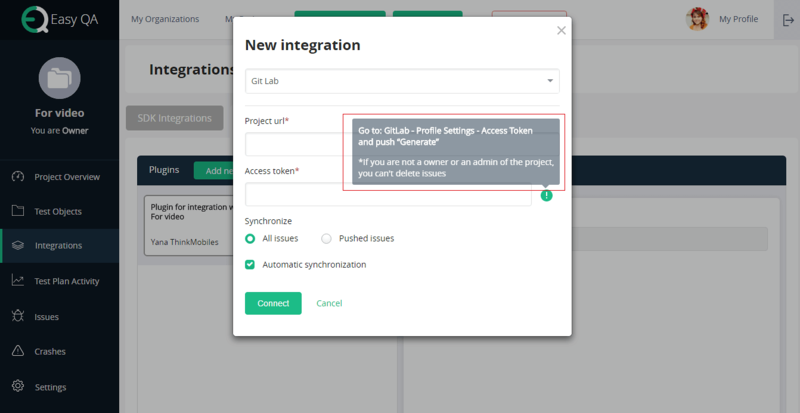 To generate a new tocken you should access GitLab->Profile Settings->Access Tokens, type required info and click "Create Personal token" button. Now you are ready to generate test build from your project code stored on GitHub or GitLab. Click Get Test Object button on Test Objects page. After this you will see the form for selection the service from what you want to generate the build. After the generation process completed, you will see your build on Test Objects page. Using EasyQA test management tool to upload, store and share test builds, you can efficiently manage all organization processes in the project, especially the testing process, which has already implemented any kind of functionality. All of mention above is very useful. You just need to try it now on a real project. We hope the entire developing team will love it.